Rogga Johansson. No matter how many outfits he is a part of that get covered on these pages, no matter how many albums he puts out, there are certain notions always associated with that name. Death metal, predominantly old school. Mostly quality stuff. 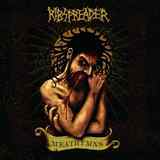 I wish I would have Rogga’s formula for how he decides which band of his gets what material, but, luckily, I only have one album to review hereby, Ribspreader’s new offering Meathymns. And I am happy to report that it is plenty of fun. Pulling a step away from mid-pace, very by the book, Swedish school with a bit of monotony, Rogga & Crew turned the deathgrind machine up a notch in speed and something like 10X in catchiness, creating one hell of a hooky album. It isn’t like Ribspreader riffs have become wildly variable and unpredictable. We are still talking about warbling tone, penetrating, one line riffs, but the songs on Meathhymns are playful and contain more outward melody than some complicated prog fixtures, resulting in singularly entertaining and engaging beatdown. Every song on the album, except the somewhat weird instrumental closing title track, lays down guitars with a lot of thrash and punch to them, but almost always finds a quick introspective moment to pull away into after which the aforementioned catchy melody is unrolled. True, the blueprint is followed rather consistently (Orchestrating the Cacophony, As the Blood Flows), but the breakdowns on the album are not too slow, and by the time The Ones Who Hide and Wait begins decelerating, you already know what is to follow. As rhythm guitars continue with their one-dimensional savage plunges, drums remain just one step ahead with almost constant d-beat and bass mostly follows along just further padding the bottom end. Rogga’s vocals are consistent and meaty, and at times almost legible. Quick tremoloed “saber dance” melody of Dragged Below and similar mid-song mow-down of Skeletonized, the killer melodic opening of Worm Infested, the 1:30 min riff of Asylum of the Rotting – these are the moments that may not be pinnacles of out-of-the-box creativity, but they certainly lay down memorable fun markers along the way in Meathhymns. Combining the guitarworks and themes of Heartwork-era Carcass, simplicity of Unleashed and tonality of Entombed/Grave, Ribspreader stays squarely on the path Rogga chosen for the band a while back. Meathymns provides for a 30 min enjoyable experience, especially when you know what to expect. If you are prepared to tap your feet uncontrollably and headbang mindlessly, without pretense, Meathymns is for you. Just make sure that neckbrace you always wanted has been ordered.